Border Security Force, the “First Line of Defence” securing Indo-Pak and Indo-Bangladesh border since 1965 has proven its mettle in Border Management. The spirit of sincerity and devotion to duty which has been imbibed in Seema Prahari’s is displayed and executed in all fields. Sports activity is a very prominent one in this respect. 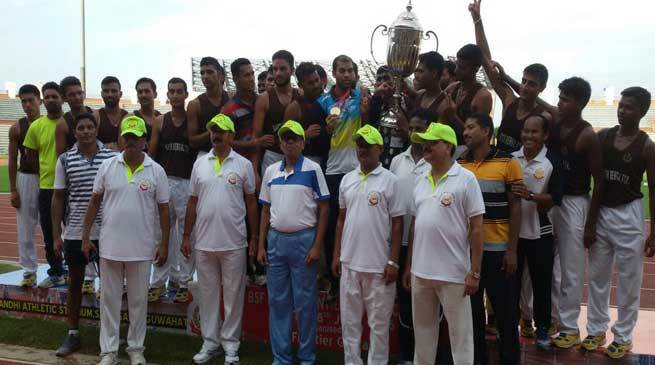 A total of 500 BSF athletes from all over India participated in 23 disciplines and displayed their talents. North Bengal Frontier of BSF stood first in the overall medal tally of 79 points, while Jammu Frontier stood second with 74 points and Tripura Frontier stood third with 65 points each. During his address to the athletes Sh Mukesh Sahay, IPS, DGP, Assam, Chief Guest of the event exhorted the winners to strive for excellence and at the same time encouraged the rest to try to excel in subsequent events. BSF has a fine tuned system to identify potential talent, who are mentored nurtured by utilizing the resources of the Force. These talents are given employment in BSF where they are afforded opportunity to showcase their talent. The BSF Athletic team has always performed exceedingly well in the All India Police Games and obtained First position on 15 occasions, second on 21 occasions and third position on 09 occasions. Several BSF players were the back bone of the National Football and Hockey teams which had participated in Commonwealth Games, Asian Games as well as in Olympics. 17 sportsmen of various disciplines belonging to BSF have also been honored with ARJUNA AWARDS. Besides this, Sh Ajitpal Singh, former captain of the Indian Hockey team which had won the 1975 World Cup at Kualalampur and Sh Loveraj Singh, a renowned mountaineer, who had scaled the Mount Everest 05 times have also been honored with PADMA SHRI AWARDS.